This volume examines transparency of defence policies, budgeting and procurement within the countries of South Eastern Europe. Particular attention is given to the continued process of reform within national armed forces, and of the need for greater accountability on the part of defence ministries and armed forces with regard to the planning, programme and project management, procurement, and spending. The "Monitor" section provides information on relevant books, research projects and regional cooperation initiatives. Editorial. "Transparency Matters." Information & Security: An International Journal 11 (2003): 5-8. Monitor, ISIJ. "A Call for Holistic Approach to Defence Transparency in South East Europe." Information & Security: An International Journal 11 (2003): 165-166. Monitor, ISIJ. "Transparency in Reforming the National Security Sector in Transition Countries." 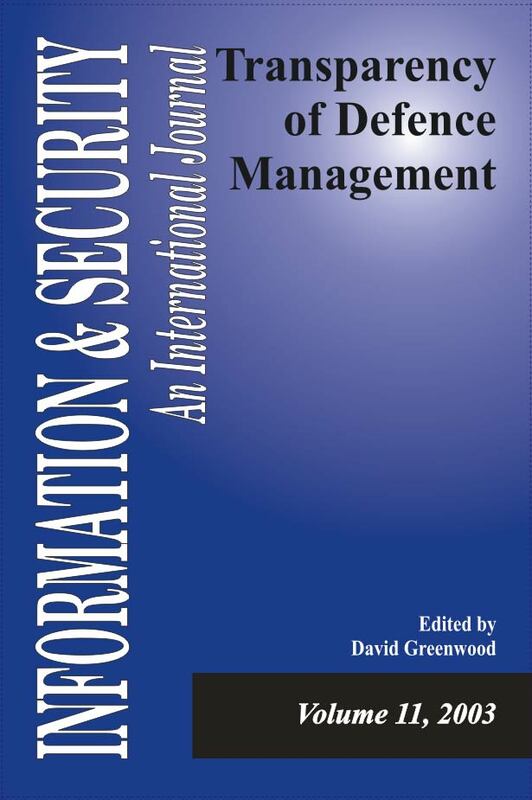 Information & Security: An International Journal 11 (2003): 167-170. Monitor, ISIJ. "Transparency-building in the Security Sector." Information & Security: An International Journal 11 (2003): 171-172. Monitor, ISIJ. "Budget Transparency Initiative Website." Information & Security: An International Journal 11 (2003): 173.